Ready or not -- winter is just weeks away, and Storm Team4 Chief Meteorologist Doug Kammerer has your Winter Weather Outlook. Last year, Doug predicted the big blizzard that hit our area in January two months before the big storm. In creating the winter forecast, we look at numerous weather patterns and teleconnections from around the world. The biggest is the El Niño Southern Oscillation, which looks at the water temperatures along the Pacific Ocean off the coast of South America. Those water temperatures have a big impact on the weather patterns around the world. We are coming off of one of the strongest El Niños ever and we are moving into a weak La Niña. That La Niña is expected to persist through the winter. If we were looking at the La Niña alone, we would expect a wet and mild winter, but there are other factors at play. One other factor is Siberian snow cover. It may seem odd, but the amount of snowfall in Siberia in October has been found to have a very good correlation to our winters. This year, that snow cover is way above average. 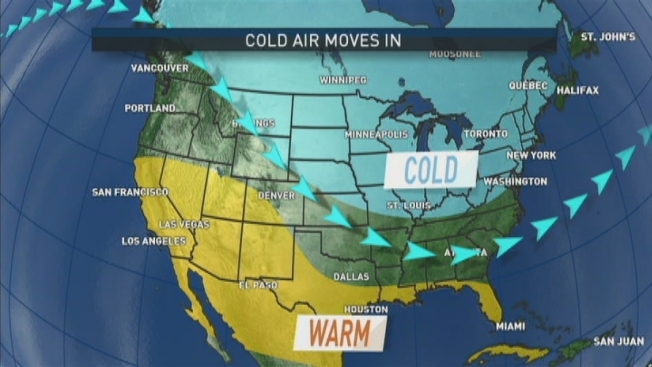 This would translate to a colder winter for us, but it doesn’t necessarily mean more snow. We also look at water temperatures in the North Pacific, Arctic Sea ice and many other factors. Putting everything together, I see a colder-than-average winter, with December and January being very cold. A few days will likely dip into the teens. It may be so cold that our storms are pushed too far to the south to give us any big storms. February may be the warmest winter month and Storm Team4 expects temperatures will be well above average. The cold will try to make a return in March and that's when I think we could see our biggest storms. We still expect snow, but I am not predicting another blizzard this year. I believe we'll have average or slightly above average snowfall. with more to the north and west and less to the south and east. The D.C. average is just over 15 inches a year and I think we'll see 14 to 20 inches along the I-95 corridor, with more to the north and west and less to the south and east. One thing we may see more of, however, is ice and I do think we will have quite a few days off of school this year!